From Nate Davis' "Joe Flacco an overachieving headliner on '09 All-Joe Team"
QB: Joe Flacco, Ravens— Who more appropriate to lead the All-Joe team than Joe Cool? The sophomore continued to blossom in the passing game while taking a greater role in leading Baltimore back to the postseason. Alex Smith, 49ers— The former No. 1 pick waited for a chance to revive his career then did just that after becoming a starter in November. Matt Moore, Panthers— Every team needs a good emergency quarterback, so why not pick a guy who won four of his five starts after replacing Jake Delhomme and outdueled Brett Favre and Eli Manning along the way. RB: Cedric Benson, Bengals— A consummate hard hat guy, he led the NFL with 23.2 carries per game and rushed for a career-best 1,251 yards in just 13 games for the AFC North champs. Fred Jackson, Bills— Did you know his 2,516 all-purpose yards were the fourth-most ever? Did you know he became the first player to rush for 1,000 yards and have 1,000 kickoff return yards in the same season? Quite a year for undrafted former Division III standout. Jonathan Stewart, Panthers— Pro Bowler DeAngelo Williams' backup only started three games, but led Carolina with 1,133 yards on the ground despite battling foot and Achilles' problems. Stewart and Williams became the first teammates to both rush for 1,100 yards in the same season. 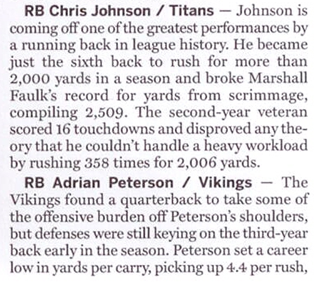 FB: Ahmard Hall, Titans— When you have a hard-nosed former Marine as your point man, as Chris Johnson did this year, it becomes a little easier to rack up 2,000 yards. WR: Santonio Holmes, Steelers— Followed up his Super Bowl stardom with his first 1,000-yard season. Sixty-three of his 79 grabs produced first downs. Greg Jennings, Packers— With 16.4 yards per catch, this emerging talent makes the most of his opportunities. Jerricho Cotchery, Jets— Given his reliability on third down and ferocious downfield blocking, he could be the next Hines Ward. Jason Avant, Eagles— Fearlessly plies his trade over the middle. But he can also step in seamlessly as a starter as he proved in San Diego (8 catches, 156 yards). TE: Zach Miller, Raiders— Despite Oakland's passing game, he's averaged 61 catches and nearly 800 yards the past two years. He also blows people up as a blocker. Brent Celek, Eagles— He stepped up as one of the weapons Donovan McNabb needed, falling 29 receiving yards shy of 1,000 while catching a team-high 76 passes. T: Michael Oher, Ravens— All-Joe guys generally don't translate to the silver screen, but Oher lived up to his first-round billing and storybook background, shining at both tackle positions. 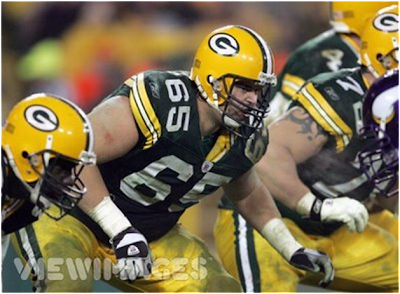 Mark Tauscher, Packers— Fought back after shredding his knee at the end of the 2008 season. Once he got back on the field, QB Aaron Rodgers was sacked only 15 times in eight games. He went down 35 times before that. Winston Justice, Eagles— The 2006 second-rounder seemed to be a bust. But he stepped in for injured Shawn Andrews and started all 16 games at right tackle. G: Brandon Moore, Jets— The Jets cut him in the offseason then decided they couldn't do without him. He justified that decision as a linchpin of the NFL's No. 1 rushing attack. Jake Scott, Titans— Another of Chris Johnson's favorites. Nate Garner, Dolphins— Gotta like any guy who can play tackle, guard, center and even tight end. C: Jason Brown, Rams—Steven Jackson doesn't lead the NFC in rushing without this guy. Alex Mack, Browns— A major reason the Browns finished eighth in rushing offense. 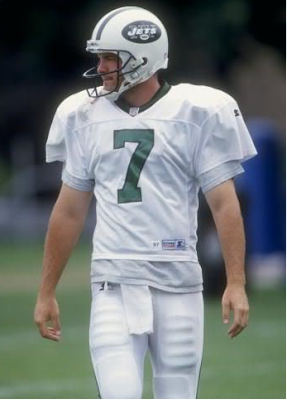 K: Ryan Longwell, Vikings— Somehow, one of the game's finest kickers has never received Pro Bowl recognition. We'll take anyone who goes 26-for-28 on field-goal tries. KR: LaRod Stephens-Howling, Cardinals— Rookie averaged 24.2 yards a pop while serving as a willing tackler on coverage teams. LS: Jason Kyle, Saints— On target for the biggest snap of the season in overtime of the NFC Championship Game. Good enough for us. Football years, like dog years, are a complicated calibration of time. According to calendars, Bob Diaco will turn 37 next month. Just a pup, in some regards. In football years, Notre Dame's new defensive coordinator is a grizzled mutt. Eight stops in 14 years, enough to form a qualified opinion on rating moving companies. An Iowa playing pedigree touched by the thumbprint of Hayden Fry. In his first year with Cincinnati, retooling a 2009 defense that lost 10 starters and making it through the regular season without a loss. Diaco doesn't command a room with his "presence." He's an "energy" guy. He's the opposite of crusty 52-year-old Jon Tenuta, who occupied Diaco's office during last year's miserable season. Diaco's not the sort of defensive coordinator that will get hung up with an approach. The Irish will play a 3-4 alignment next season, but the foundation will take precedence over the scheme. "Genuinely, there are some core principles to playing great defense," Diaco said. "Effort. Hustle. Tackling. Maintaining the top of the defense. That won't change. The bulk of the work and preparation is built into that." Diaco thought he had a challenge in Cincinnati last year. Wait 'til he gets on the practice field in March and gets a first-hand look at a Notre Dame defensive unit that had its heart ripped from its chest in each of its last four games. He's charged with putting the pieces back together from a unit that ranked 86th (out of 120) in the country in total defense (398 yards a game) and was 89th against the run (170). The Irish were gashed by Navy's Vince Murray (158 rushing yards) and Ricky Dobbs (102); Pittsburgh's Dion Lewis (152); Connecticut's Jordan Todman (130) and Andre Dixon (114), and Stanford's Toby Gerhart (205) during a painful November. The Irish lost more than games that month. They lost confidence. "Confidence comes from the preparation," Diaco said. "We like to believe that how the information is going to be communicated to the player is top tier. The fundamentals that we're going to work every day; the nuts and bolts things that need to be done, will be done - we won't miss a day. "We'll have a clear focus on those nuts and bolts - blocking and tackling; block destruction; ball security. At particular points in the season, where you're so focused on a particular formation, or player, or system, you lose some of those core fundamentals. (Head) Coach (Brian) Kelly, our philosophy, that never happens. The nuts and bolts things are addressed each day and worked each day." Everything that went into the week's preparation, comes to a head on Saturday. "Never happens. Coach Kelly doesn't do it. They're not gonna play great because of some speech. It's in the preparation." The passion burst in Diaco's eyes. "When (the ND defenders) grab the opponent," he said, both hands clenched, trembling, in a blocking motion, "they got 'em. There's confidence there." Sounds good. Why not believe a coach who is man enough to quote a saint? 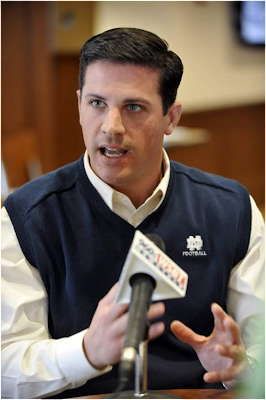 "I read a quote ... from St. Augustine, and I thought it was just awesome," Diaco said. "'With love and diligence, anything is possible.' That's present in the coaching and teaching every single day. "I love teaching young men to become productive young men through football. That's really it." So is a defense that doesn't resemble a sieve. It's time to look back at the best Big Ten coaches of the decade. The top choice was a no brainer. After that, it gets interesting. 1. Jim Tressel, Ohio State: Other than USC's Pete Carroll, no coach dominated a major conference this decade like Tressel dominated the Big Ten. Since 2001, Tressel has won a national title, six Big Ten titles (outright or shared), five bowls and four BCS bowls. He owns a 94-21 record at Ohio State, and, perhaps more impressive, a 59-13 mark in Big Ten play. This was unquestionably the decade of The Vest. 2. Kirk Ferentz, Iowa: Ferentz revived a struggling Iowa program this decade and restored the Hawkeyes among the Big Ten's elite. Since 2002, he has guided Iowa to two Big Ten championships, four seasons of 10 or more victories and eight bowl games, winning five of them. Iowa owns four top-10 finishes this decade under Ferentz, who gets a slight edge over Lloyd Carr. 3. Lloyd Carr, Michigan: It seems like a while since Michigan last won a Big Ten title, but Carr's teams claimed three of them (two shared, one outright) in the first half of the decade. 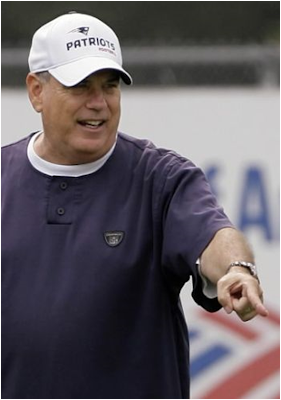 Michigan finished first or second in the league in seven of the eight years Carr coached this decade. He struggled against Tressel and in the Rose Bowl, but Carr's accomplishments shouldn't be overlooked. 4. Joe Paterno, Penn State: Paterno is right up there with Tressel in the second half of the decade, winning two Big Ten championships and averaging 10.2 wins per season between 2005-09. Four losing seasons in the first half of the decade sting a bit, but JoePa is getting better with age! 5. Joe Tiller, Purdue: Tiller won his only Big Ten title in 2000, and Purdue reached bowl games in the first seven years of the decade. Purdue's all-time coaching victories leader made the Boilers into a consistent upper-half Big Ten team in the aughts. 6. Bret Bielema, Wisconsin: Bielema probably hates being listed ahead of his boss and predecessor, but his record in the past four years speaks for itself. He owns a 38-14 record at Wisconsin (20-12 Big Ten) and has taken the Badgers to bowl games each year. 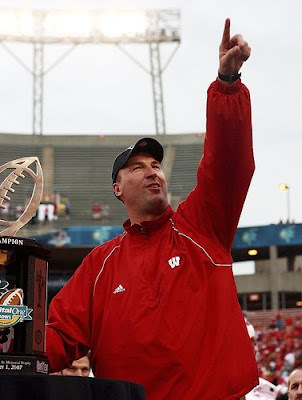 Bielema coached Wisconsin's best team of the decade in 2006, a squad that went 12-1 and finished seventh in the final AP Poll. 7. 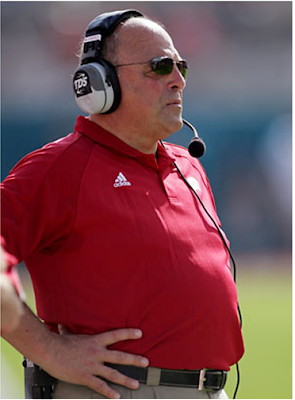 Barry Alvarez, Wisconsin: Alvarez was arguably the Big Ten's Coach of the 1990s, and he kept the program among the league's elite until he stepped down following the 2005 season. He had three seasons of eight or more victories and won three bowls during the decade. Alvarez's best season this decade came in his last, as Wisconsin went 10-3 and beat Auburn in the Capital One Bowl. 8. 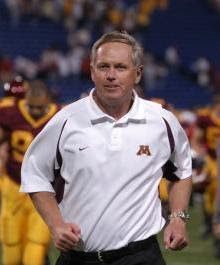 Glen Mason, Minnesota: Mason coached Minnesota to six bowls in seven years until his dismissal after the 2006 Insight Bowl. He oversaw one of the nation's top rushing attacks this decade as backs Laurence Maroney and Marion Barber III piled up yardage. Mason had a 10-win season in 2003, but his inability to get Minnesota to the next level led to his firing. He went just 24-32 in Big Ten play this decade. 9. Mark Dantonio, Michigan State: Dantonio has stabilized a Michigan State program that really underachieved for most of the decade. The Spartans have reached bowls in each of Dantonio's three seasons as head coach. Dantonio owns a 13-11 mark in Big Ten play, which is much better than his predecessors. 10. Pat Fitzgerald and Randy Walker, Northwestern: The two Wildcats coaches share this spot after bringing consistency to a program that reached historic lows before 1995. Walker won a Big Ten championship in 2000 and took NU to three bowls in six years this decade. Fitzgerald, who took over after Walker's sudden death in 2006, owns 17-9 record (10-6 Big Ten) in the last two seasons. Expect him to be much higher on this list in the next decade recap. From Michael Maxwell's "Hawkeyes Football: Just Call Iowa “Tight End U”"
For years Penn St. has been fondly known as “Linebacker U”. That is a name that has stuck because linebacker is certainly the glamour position on defense, and Penn St. has produced more than their fair share of talented backers over the years. 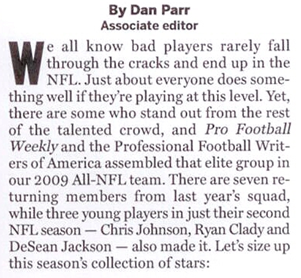 Conversely, I’m sure few people would refer to tight end as a glamour position on offense. The tight end has become somewhat of a lost art in this day and age of the sophisticated spread offenses. Yet, nobody takes better advantage of the tight end in the country than Iowa. In fact, Iowa’s pro style offense is one of only a few teams in the Big 10 where the tight end still plays a prominent role in both the passing and running games. While it might not have as much cache and glamour as the term “Linebacker U”, there is no question that the University of Iowa has earned the title “Tight End U”. A connection to the blue collar position of tight end is perfectly suited to the gritty, never-say-die attitude of recent Hawkeye teams led by Kirk Ferentz. This prestigious designation as “Tight End U” is based upon not only the recent talent the program has produced at tight end, but also the historic talent going all the way back to the early days of the Hayden Fry Era. 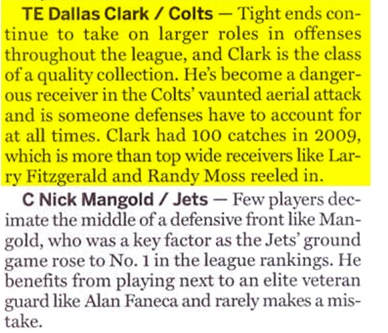 Hard to believe that Dallas Clark only played two seasons at tight end at Iowa. Clark made the team as a walk-on linebacker in 2000 but was converted to tight end during spring practice in 2001. What a move that turned out to be! In 2002, Clark enjoyed one of the greatest years of any tight end in school history. He had 43 receptions for 742 yards and four touchdowns. He was a consensus All-America and won the John Mackey Award as the nation’s best tight end in 2002. 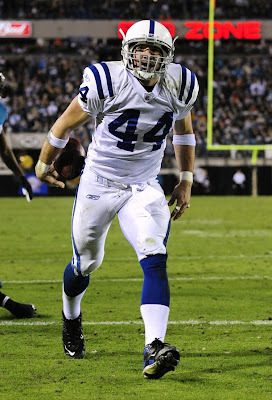 Clark left Iowa after his junior season and was drafted by the Indianapolis Colts in the first round, where he has developed into one of Peyton Manning’s favorite targets. 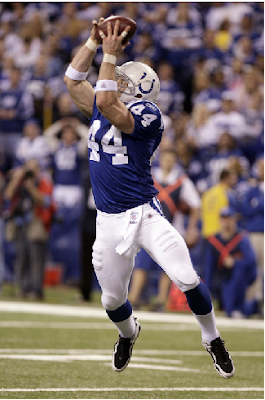 Clark won the Super Bowl with the Colts following the 2006 season and in February 2008 signed a multiyear deal with the Colts that made him the highest-paid tight end in the NFL. The 2009 season produced big improvements in performance for many NCAA college football teams. But which teams improved the most from their 2008 ranking? I examined the statistical ranking changes for all top 50 teams of 2009. Sagarin rankings were compared from 2008 to 2009. Each improvement in ranking by one place produced one point. Improved top 25 teams received bonus points weighted from No. 1 to No. 25. So who were the top improved teams in 2009? Alabama Crimson Tide. The Crimson Tide benefit from 25 bonus points for finishing first in the nation. Ranked sixth in 2008, 2009 produced a national championship for Nick Saban and the fans of Alabama. Auburn Tigers. The Tigers ranked only 60th in 2008 but jumped to No. 28 in 2009. Gene Chizik led the Auburn Tigers to an 8-5 record with a 38-35 win over Northwestern in the Outback Bowl. William & Mary. This is not a joke. William & Mary finished 49th in the 2009 Sagarin rankings. This is a significant improvement from their 82nd ranking of 2008. The Tribe produced an 11-3 record in 2009 and advanced to the semis of the 2009 FCS national championship. They lost to the Vlllanova Wildcats 14-13. Villanova Wildcats. Villanova improved from a rank of 63rd in to 2008 to 30th in 2009. The Wildcats finished 14-1 in 2009. They defeated Montana for the 2009 FCS national championship. Georgia Tech. Georgia Tech finished No. 13 in the Sagarin 2009 poll. Their 2008 ranking was 36th. Coach Dan Radakovich led the Ramblin' Wreck to the BCS Orange Bowl where they were defeated by the Iowa Hawkeyes. Wisconsin Badgers. 2008 proved difficult for the Badgers and they placed 61st in the final Sagarin poll. Wisconsin jumped back to a top 25 ranking in 2009 coming in at No. 23. 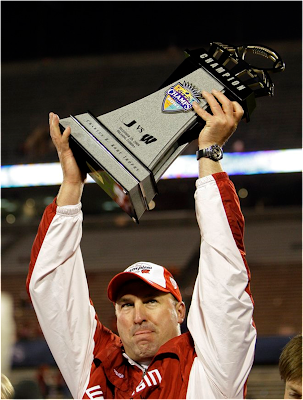 Coach Bret Bielema led his Wisconsin team to a 2009 Champs Sports Bowl Victory over the Miami Hurricanes. Cincinnati Bearcats. The Cincinnati Bearcats reached top 10 status in the Sagarin poll placing No. 9 in 2009. This is dramatic improvement from a 2008 ranking of 34th. Coach Brian Kelly led his team to a 12-0 undefeated season before being named head coach at Notre Dame. The Bearcats fell to Florida in the Sugar Bowl 51-24. Mississippi State. Mississippi State improved from 93rd in 2008 to 45th in 2009. In 2009, Mississippi State only produced a 5-7 record. However, the Bulldogs were competitive in the tough SEC conference and defeated intrastate rival Ole Miss in the 2009 Egg Bowl. Central Michigan. Central Michigan made the top 50 rankings in 2009 coming in at 42nd. This is 54 spots higher than their 96th ranking of 2008. The Chippewas defeated Big Ten rival Michigan State and prevailed over Troy in the 2009 GMAC Bowl 44-41. Arkansas Razorbacks. The Razorbacks scored highest in the improvement poll jumping from No. 64 in 2008 to No. 19 in 2009. With eight bonus points their total score of 54 ties with Central Michigan. But the Razorbacks get the top spot because of their higher final ranking. Bobby Petrino led the Razorbacks to an impressive 8-5 record.. They topped East Carolina University 20-17 in the Liberty Bowl. Over the past three seasons, he has more all-purpose yards than any other player in the NFL, with the top five stacking up this way: Cribbs with 6,345, San Diego's Darren Sproles 6,052, Minnesota's Adrian Peterson 5,741, Jacksonville's Maurice Jones-Drew 5,639, and Miami's Ted Ginn Jr. 5,486. 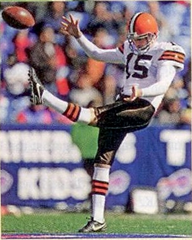 From John Ed Bradley's "A Booming Boom"
Statistics suggest that this is the golden age of NFL punting. During the first 12 weeks of the season, the average punt went 44.3 yards, a half yard farther than the record set last year. Punters were on pace to drop 868 balls inside their opponents' 20-yard lines, 103 more than the league mark set in 2007. And the Raiders' Shane Lechler was on course to equal or break the season record of 51.40 yards per punt set 69 years ago by Sammy Baugh. Yet among fans, the punter may be the least appreciated man in the game. Even when he does his job well, placing the ball as close as possible to the opponent's goal line, he exits the field to tepid applause. More often than not, when he faces scrutiny, it is unwelcome, coming after a fumbled snap or a badly kicked ball that lands out-of-bounds just yards past the line of scrimmage. Once, after a game the Seahawks nearly lost because he shanked a punt, rookie Donnie Jones ran off the field to so many boos from the home crowd that he wanted to hide—or, better yet, vanish. "I could hear people yelling, 'Get a day job! You should be behind a desk!'" says Jones. The experience left him so devastated that he stayed in bed for 20 hours afterward. But punters' recent successes, rather than their disappointments, should be examined before somebody at a year-end banquet hands a punter a trophy engraved with MOST VALUABLE PLAYER. Punters (yes, punters!) have become what coaches call difference makers, and the difference they're making has observers of the game wondering if the punter is a defensive weapon every bit the equal of a shutdown cover corner or a run-stuffing middle linebacker. The Chargers' Mike Scifres dominated a playoff game against the Colts last January with six kicks that pinned Peyton Manning and his offense inside their 20-yard line. Scifres's performance, which led the Chargers to a 23--17 overtime win, rated among the most memorable put up by any player in the 2008 season. And this season, on Oct. 11, the Browns' Dave Zastudil was so brilliant against the Bills that the eight-year veteran practically won the game by himself (diagram, opposite). He punted nine times; seven of the boots forced the Bills to start from inside their 20, and three of those put them inside their five. The Bills have a fine return man in Roscoe Parrish, but Zastudil and the Browns' cover team limited him to seven yards. Zastudil's last punt traveled 57 yards to Buffalo's 16, where Parrish fumbled the ball, setting up the Browns' game-winning field goal seven plays later with 26 seconds left on the clock. ZASTUDIL BEATS BILLS 6--3, the headlines should've read. But none did. For some reason that needs to be fixed, headline writers never think to immortalize punters. And how do you pronounce Zastudil, anyway? Is it zas-TOO-dull or zas-too-DILL? You never struggled with the pronunciation of Manning or Brady, did you? It's zas-too-DILL, and we should all be ashamed for not knowing. GREEN BAY, Wis. - Aaron Rodgers spends a lot less time in the training room these days. Right tackle Mark Tauscher's commitment to come back from a major knee injury is a big reason why. The 10-year veteran returned from a torn left knee ligament for the second time in his career and was back on the field at midseason -- after Rodgers had been sacked 41 times in the first nine games. The Pro Bowl quarterback has been sacked only nine times since and while Tauscher isn't the only reason Rodgers has stayed upright more often, he's helped stabilize an offensive line that had its share of issues this year. 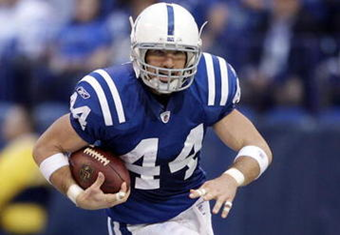 Tauscher could've retired after his injury in December 2008 to cap a successful career with postseason appearances in five different years after being a seventh-round pick in 2000. He instead will be starting Sunday when the Packers face Arizona in a first-round playoff game. "You put everything into perspective and when you're out of it and you're not on a team, it's the first time I hadn't been on a team in nine years," Tauscher said. "When you're coming back into it and now you get on a roll and things are really kind of going as they're supposed to go, it's a lot of fun." It's been a lot of fun for the entire line after nine weeks of mismatches and misery. Tauscher quickly deflects any credit for the turnaround, but coach Mike McCarthy and offensive coordinator Joe Philbin have praised his return. "Just his veteran presence, he's a steady individual, well-respected individual, and he brings a consistency to your locker room, and also it carries over to your offensive line," McCarthy said. "He deserves a lot of credit for us bouncing back from our earlier days." Those days had Rodgers going to the trainers often, including when he was sacked eight times in a loss to the Vikings as Green Bay stumbled to a 4-4 start. "I spent a lot of time in the training room really Weeks 1 through 9," Rodgers said. "As much as I love those guys and those guys do a great job, it's nice to not have to see them as much on Mondays and Tuesdays. My body feels great." The offense is also clicking with Rodgers throwing for more than 4,000 yards and 30 touchdowns, receivers Donald Driver and Greg Jennings adding more than 1,000 yards receiving each, and Ryan Grant running for over 1,200 yards. Grant's numbers have gone up since Tauscher's return, too. He averaged 4.9 yards after starting the season with a 4.2 mark and has seven of his 11 touchdowns in the last seven games. "We've been able to be on the same page, the communication level's high and we're really clicking," Grant said of the line. "They've done a phenomenal job and we're really starting to roll and become balanced." Tauscher, who signed with Green Bay in October after also working out with Kansas City, said he was just glad to come and play, even after he missed a week when he took a shot on the knee and sprained a different ligament on Nov. 8. "I knew it wasn't bad, but I also knew it wasn't great. It was good to get reassured when I got over on the sidelines that it wasn't anything major," Tauscher said. "You just go out and play and it was actually good to know the knee could hold up with that hit." 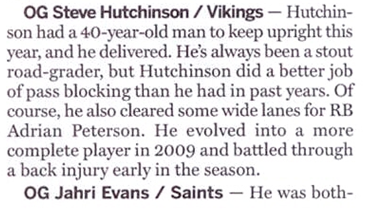 With that knowledge, Tauscher went back to being the same consistent guy he's always been. "(It's) a lot of the same old Mark Tauscher, and that's a good thing," Philbin said. "He's been a very dependable, steady player here for a long time, he's been a productive player. He's a guy you can count on, he's extremely professional. You don't worry about very much when he's in the ballgame, and at the end of the day usually his guy isn't around the quarterback a whole lot, and that's a comforting thing as well." Tauscher said he hasn't decided whether he'll continue his career next season, so he's focused completely on Arizona. "Just getting back into it and playing was my goal. Now to have a chance to get into these playoffs, that's what we play for," Tauscher said. "I've been fortunate, six out of 10 years, we've been in the mix and we've had some great opportunities. I would say this is a great opportunity now. It's just what we do with the opportunity that we have." Three months ago, Mark Tauscher was unemployed and uncertain about his future. By NFL standards, the 32-year-old Tauscher was an old man coming off major knee surgery. Who would have guessed this gimpy-legged, 316-pound has-been would walk in off the street, slip on his familiar No. 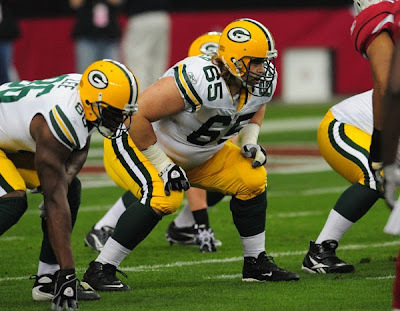 65 jersey, and transform the Green Bay Packers’ offense, and their season. Tauscher, who will line up as the starting right tackle in the Packers’ wild-card playoff game Sunday against the Arizona Cardinals, scoffs at the notion he is the savior of an offensive line that was drowning at midseason. But it’s true. Those dark days — when the Packers stumbled to a 4-4 record and their offensive line resembled a train wreck — seem like a distant memory now. Tauscher, who tore his ACL last December in the final season of his contract and put himself through a rigorous independent rehabilitation program, saw his hard work pay off when he signed a one-year deal on Oct. 12. He made his season debut Nov. 8 and two weeks later reclaimed the starting position for good that he had held since 2000. 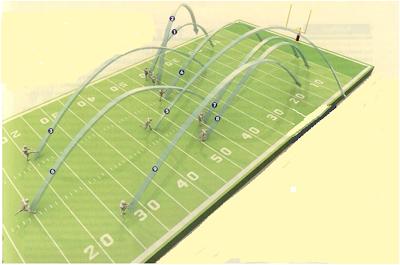 The stabilization of the line coincided almost precisely with Tauscher’s return. He shored up a gaping hole that contributed to a dizzying sack total in the first two months of the season and almost got quarterback Aaron Rodgers killed. Tauscher’s veteran savvy, football smarts and leadership skills have rubbed off on his line mates and made a telling difference on offense. After giving up 37 sacks in their first eight games, the Packers slashed that total to 14 in the second half of the season. No one will accuse Tauscher of being the prettiest player on the field with textbook form. His seventh-round draft status out of the University of Wisconsin is proof of that. But he somehow finds a way to succeed, and his teammates love him for it. That comes from intense film study and a strong work ethic. You practically have to drag him off the practice field. It was that lunch-bucket mentality that carried Tauscher through a difficult, sometimes painful offseason. It was a grind, and there was no guarantee any team would sign him, least of all the Packers, who attempted to move on with younger tackles Allen Barbre, Breno Giacomini and T.J. Lang. Tauscher, who was born in Marshfield and is the only Wisconsin native on the Packers roster, has no idea what he’d be doing if he weren’t playing football. He’s having too much fun now to worry about it. If the Packers’ younger tackles had performed well, Tauscher no doubt would have needed to find a new team or different occupation. In early October he tried out with the Kansas City Chiefs, but when the Packers came calling at about the same time, it was an easy decision. Tauscher believes his familiarity with the Packers’ system contributed to a relatively seamless transition after nearly a year out of football. This marks the sixth time in Tauscher’s 10-year career the Packers have qualified for the playoffs. 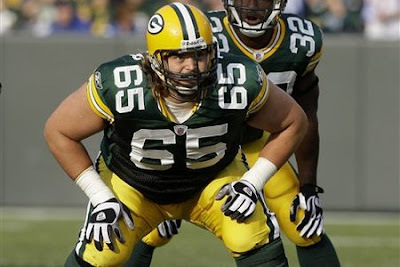 The Packers can thank Tauscher for that. WR Vincent Jackson, San Diego. 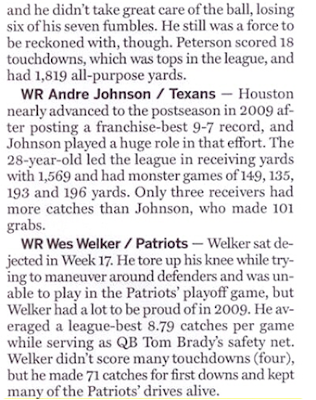 He's very slightly more consistent and just as game-breaking as Andre Johnson. Lost in the badness, Thomas is a powerful drive-blocker and deft pass-blocker. LG Logan Mankins, New England. Terrific all-around tactician and power-blocker. Rapidly becoming the Cadillac of centers. RG Jahri Evans, New Orleans. 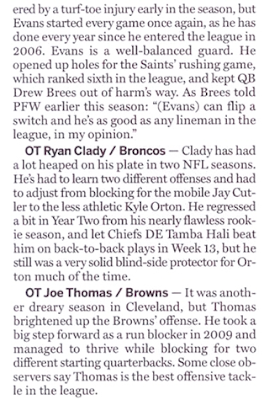 Sean Payton can fill your notebook about Evans almost as enthusiastically as he can about Drew Brees. Good idea by the Dolphins in not forcing him on the left side and allowing him to find a home here. 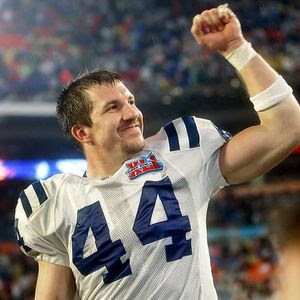 TE (tie) Dallas Clark, Indianapolis; Antonio Gates, San Diego. Love 'em both, because their Pro Bowl quarterbacks would be lost without them. Seriously. WR Wes Welker, New England. Very tough to leave Reggie Wayne off this team, but it'd be tougher for me to leave the best slot receiver of this era off too. Welker led the NFL with 123 catches despite playing, in effect, 13 games with the early season-ending injury Sunday in Houston. 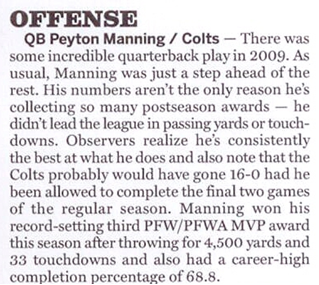 While leading the Colts to 14-0, he had his most accurate season ever, and second-most productive in yardage and touchdowns. This year, he added some toughness to his electricity, as well as the sixth 2,000-yard rushing season ever. Not many teams use a pure fullback much anymore, and no team has as physical a blocker as Polite. 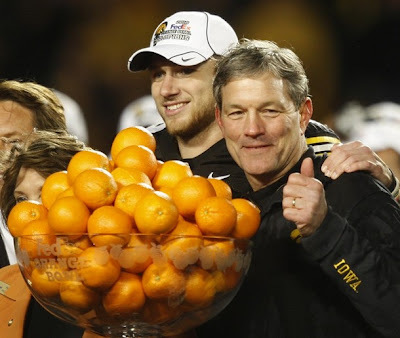 Kirk Ferentz did something totally out of character with a three-point lead and about seven minutes left in the FedEx Orange Bowl. He called for a fake field goal, which failed miserably and gave Georgia Tech's offense new life with 6:45 left. Then, a few minutes later, Ferentz did something totally in character. He celebrated a huge win for his Iowa program. 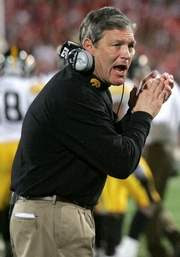 As he stood on the victory podium, Ferentz probably wasn't thinking about April 2008. Back then, Iowa was coming off of three mediocre seasons. The team had more player arrests and legal issues than wins and All-Big Ten selections. Many felt Ferentz's time in Iowa City was running out. In scrambling to find a Big Ten coach on the hot seat, several media members, including yours truly, picked Ferentz. Iowa has gone 20-6 the last two seasons with wins in the Outback Bowl and the Orange Bowl. Player conduct has improved significantly, and the team will enter next fall with Big Ten title aspirations as it competes with Ohio State and Wisconsin for the crown. Ferentz probably had a better team at Iowa in 2002, but no Hawkeyes squad better reflected what he stood for than the 2009 version. They played hard, played together and played with no ego. They were solid in their fundamentals and rarely lost focus, even after falling behind in eight of their first nine games. They overcame numerous injuries and a schedule that did them no favors. They prepared extremely hard, never more so than for a tricky opponent in Georgia Tech. The formula led to a BCS bowl win. There's not a major-conference coach who gets more out of his talent than Ferentz does at Iowa. That's why he's always on the NFL radar. But he's not going anywhere. As the Big Ten's second-longest tenured coach, it's not in his character to leave a good thing. In just a year and a half Ferentz not only stabilized the Iowa program, but took it back to the top.